The image and text that feature on this page were sent to me from Adrian Arnold and I have reproduced them here with his kind permission. Sadly, during 2010, I learned that Adrian had sadly passed away. “Here is an image of my father George Edward Arnold, sadly I know very little about my father as he died in 1956 when I was 3 years old. He was born in 1910 in Town St Brandon and his parents were George and Priscilla (nee Thompson). 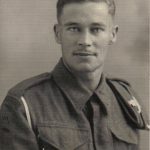 I assume that he was called up during the war as the photo was taken in 1944 and he served in the Royal Artillery. As far as I know he did not leave the country and the fact that he suffered from Asthma may have been the reason.